I can't thank you enough for everything you did for Amiya's birthday this Saturday, and even though it rained (of course for the first time in like 10 years) the children were just transfixed in your magic. It was a pleasure meeting you and if anyone is thinking of using Becky, I cannot recommend her highly enough. The world needs more Becky's. I cannot imagine a more magical way to celebrate my daughter's 5th birthday. From set up to pack up Beck and Fairy Flutter were amazing. The staging was spectacular and Fairy Flutter herself was entertaining and fabulous - the girls and parents alike were thoroughly impressed. 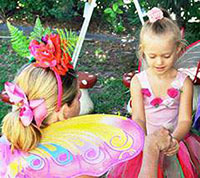 That is exactly what Madi's 5th Birthday party with Becky the Fairy and her most amazing helper Tink, was, pure magic! What a most wonderous afternoon even the rain couldn't stop the magic! The girls were enthralled for the entire time. Your expertise transforming not only yourself but my garage into something straight out of a fairy book was amazing! So lovely to have met you & I can't thank you enough for making my little princess's day so special. We haven't stopped talking about it, would book you again in a heartbeat.